This page last modified 2019-01-05 07:18:45. I had to kill this guy three times to get the quest done for multiple characters. I waited 15 minutes between each kill and respawn and took a total of half an hour and small change (counting fighting time and that he was there when I arrived). Location is close on the post below -1869 +121. He does wander though and he is undead as undead critted him a few times. Max hit was 2k with CS/CA (AA) both at level 32. I was hesitant to try this with my Tier III Merc Warrior but decided I could just root him if something went wrong. I put a HoT and Promised heal on my Merc, pulled with Mark of the Unsullied Rk. II, and put my Hammer pet (spell not AA) on the mob's back (backstabs). I went down to 10m but got it done, Devout Light Rk. II heals. My wizard is so not uber, really I'm not. You'd be scared of everything too if you were a silk wrapped cocktail weenie. So I read these posts and thought maybe she had a chance. The combat took under a minute, 40% of her mana, and she was never hit. He has no pet, he doesn't summon, he is rootable and snareable, and has low resists to magic, fire and cold. 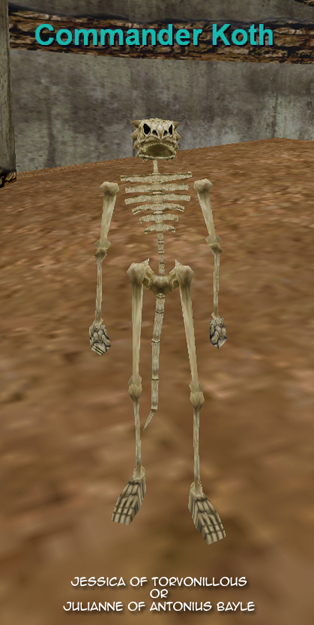 There are two of these mobs, In Field of Bone he is undead, in Field of Scale he is very much alive. Any ideas on the FOS spawn time. Will update a pic with him so Alla can pick him up and maybe seperate him from this thread. This guy was SIMPLE! Just go into the ruins, and he should be right there. He doesnt SI, he is snare/rootable and there are no adds around him so you can easily kite him. Took a few nukes, but then he went splat. Never broke the snare and he didnt run at 10%. He dropped one skull and nothing else. He does run at 10%, but extemely slow. Just killed him again today for a friend, he does run at 10% or so, but extremely slow. Soloed him with my 80 ranger 3070ac, 27.5k hps, no defensives (I'm dps not a tank). Also had my tier 4 cleric merc. Max hit was 2891. I had to Weapon Shield him til I got him slowed with my 1.0. Without the slow I think he would have gotten me. Merc kept me up so I got him instead. 71 Necro here with average gear. I've kited this guy twice thus far with not a single spell resist. At my level, he takes alot of mana, and alot of time, maybe about 5 or 6 minutes, but easily doable solo even at 71. Seems like in death, we all become our perfect selves. Since this quest is being done heavily right now, I figured I'd post as much accurate information on this mob as I could. My encounter with him lasted 1:13. These numbers are based on Mages 81 air pet tanking with max pet defensive aa's for level 84. I can confirm his spawn time is almost exactley 20 minutes. My parse shows I did 172,432 damage, so I'd say it's a safe bet to say he as 170,000 HP. I saw a necromancer easily solo him just as I was getting there, so he is very kiter friendly, as already stated. His minimum hit was 687 (bash), his maximum hit was 3014 with an average of 1343 throughout the battle. He did about 722 DPS. After just an aa malo he didn't resist any of my nukes, so he's not heavily resistant. This is a pure melee fight, I didn't see any spells or procs from him. I was able to keep him from running by quickly burning him down at low life so my parse would stay accurate. Low resists, pure melee, kiter friendly. Runs at low life. hits for close to 3k, had a few hits over 2800. most hits were 1500 and under, easy duo with merc. Just to the north of the first building you come to as you enter the ruins for Kaesora. Can confirm he is snareable and rootable. Also, runs at 10% health. Had him run at 13% for me today. Undead nukes say,"This spell only works on undead." I thought he would be harder than he was - rooted him and he never broke root. I was able to dot him to death without getting a scratch on me. Only drops a single skull (of course, why would anyone drop more than one), so it's nice to know that it's easily soloable. He is for the Skull of the Ancient Task in the Grand Illusion quest arc. Phara Dar asks for you to find a skull with no trace of life in it. Kill Commander Koth, loot his skull and bring it back to Phara Dar, then your done. He's found in the old FoB, not the SoD version. Look in the old fort area surrounding the Kaesora zone in, he'll be wandering in there. He's a 20 minute spawn. I can not undead slow him. Will not let me.